Comes in an OD green canvas pouch. 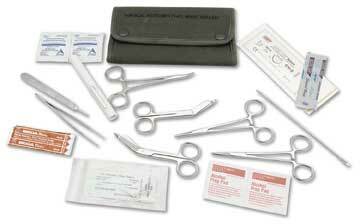 Contains (2) straight hemostats, (1) curved hemostat, (1) scissors, (1) #3 scalpel handle, (2) scalpel blades, (2) suture sets, (1) tweezers, (1) needle probe, (2) alcohol wipes, (2) iodine wipes and (1) pen light. All (non-sterile) stainless steel instruments.